HTC Desire Eye gives your selfies the megapixels they deserve | What Hi-Fi? Taking 2014's love of selfies and running with it, HTC has announced the launch of the Desire Eye, which offers the highest quality front-facing camera on the market. While the rear snappers on our smartphones have crept up past the 40MP mark in some cases, front-facing cameras have been left behind - often stuck at little more than 3MP and resulting in poorly lit, grainy pictures. 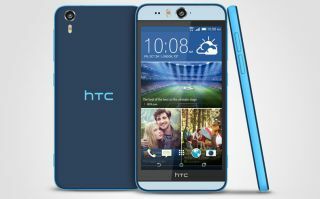 The HTC Desire Eye addresses this problem head on, packing a wide angle 13MP lens with autofocus and dual LED flash on both the front and rear of the phone, giving as much attention to your selfies as to the other photos you take. Not just that, but it's loaded with software that aims to improve the whole experience, including features like voice control, split screen functionality and face tracking when video calling. There are also a number of fun features like Face Fusion, which blend two faces together to hilarious results, and the ability to apply 'Live Make up' to your image for a softer, more flattering appearance. Known as the "Eye Experience", these features will also be coming to selected HTC phones in a software update soon. Photography smarts aside, the Desire Eye sits at the top of the Desire range, meaning it's a mid-range phone but with many specs that mirror the HTC One (M8). This includes a 2.3GHz quad-core Snapdragon 801 processor with 2GB of RAM, 16GB of expandable on-board storage (up to 128GB via microSD), a 1080p screen and 2400mAh battery promising up to 20 hours of talktime over 3G. The biggest difference compared to its flagship sibling is in the way it looks. As part of the Desire range, it packs a brightly coloured plastic design (a choice of blue on blue or red and white) in place of the One (M8)'s more premium aluminium body. However, it does have the added benefit that it is IP7 waterproof, meaning it can be submerged in depths of 1m for up to 30 minutes. The HTC Desire Eye will be available in late October, exclusive to Three.